Do you think HD TV gives crystal clear pictures? Well you have seen nothing yet. Imagine a TV picture that is 4 times as clear as Full HD TV… It makes watching a football match or a documentary like you are part of the action. It just looks real like never seen before. Toshiba is launching a new ultra high definition TV, 4K TV that is 4 times the resolution of Full HD format. It can even upscale your Full HD content to near 4K picture quality! Sounds magical to us… How do they do it? What is inside the box? People are not interested in how the unique processors, CEVO 4K engine, works but we want you to show us what crazy, unexpected, surreal, beautiful, mysterious things could transform Full HD content into magnificent real-life like videos. 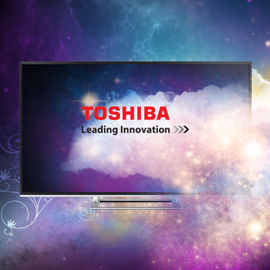 Imagine what creative and surprising things could be happening inside a Toshiba 4K TV that magically transforms a Full HD TV program into ultimate, magnificent real-life like videos, through an original and high-quality video or animation. Format: Video or animation. Contest will end on November 17, 2013. Do not hesitate to share your feedback and to ask questions on the Discuss tab! We wish you good luck and looking forward to receiving your videos!